Hello I had an issue with settings my depth and cut into the spoil board unfortunately. I can pay for the new board no problem just need to know who to contact. For future situations like this, not necessarily involving multicam, a pic of the issue/damage would be helpful. Rude915, I am at DMS now. The damage can be repaired. Are you available to come do that per the video instructions? 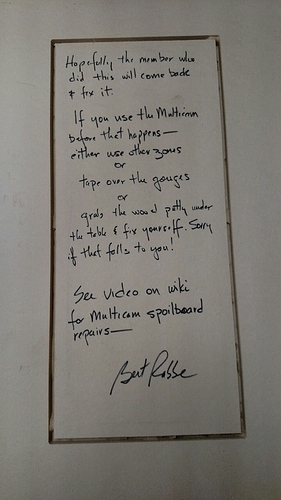 FYI, making your own spoilboard repairs is part of the commitment when you use the Multicam. I completely understand I will be there as soon as possible I have seen the video and won’t let this happen again. 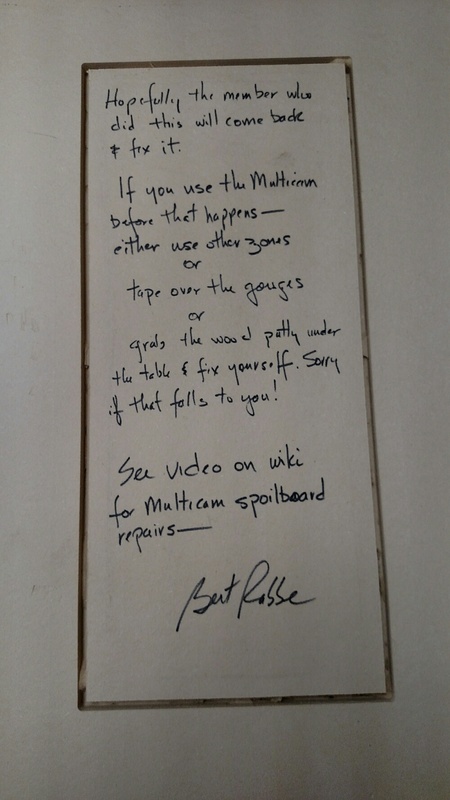 Just a note to say … much appreciate a Maker stepping up, reporting a mistake, and when it is determined there is a repair that is both authorized and within normal skill sets … goes in and takes care of things. I know “Being Excellent” is quibbled over by some as too vague or whatever, but this is a good working example!